The longest and the toughest shift is the one from 10 or 11PM to 6AM the next day, or sometimes even as late as 9AM. Those who work the night shift must face hours of utter silence, the most humid and coldest hours of the day, as well as unwelcome attention from some homeless wanderers and drunkards. And for these reasons, Ms. Gao usually assigns men to the night shift. Her concerns are not unfounded. The gentleman in the film, Lin Xiao-long, once had a drunkard yelling right at him; and then there was someone riding a motorbike who purposely pointed the exhaust pipe closer to his ears; once, he even got punched in the face a few times by a homeless person. Lin Xiao-long is 6 ft tall, and in the prime years of his life. But he didn’t fight back. He only warned the homeless man: there are surveillance cameras behind me outside of the Royal Architecture Academy. As if on cue, a few men walked out of the building toward them. The homeless man quickly made a run for it. Luo Yuan, senior computer network instructor at Middlesex University. 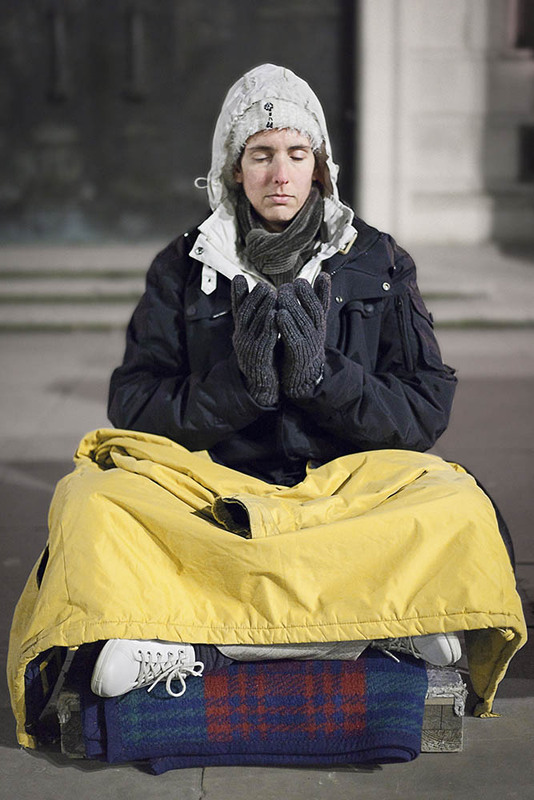 He is among the earliest meditators that began the relay vigil. Over the past ten plus years, Luo Yuan always worked the Saturday night shift. We asked him what’s the hardest thing about doing the night shift? He said, firstly, there’s the coldness; in winter, no matter how many layers of down jackets you put on, after sitting there for a while, it’s as if you’re not wearing anything. Secondly, it’s when the person who’s supposed to work the next shift fails to show up. He said, once he worked another shift right after finishing a night shift; he didn’t leave until noon the next day. I asked him how come he didn’t call Ms. Gao and tell her about it. He said: it’s okay, what could she do about it. They too, are men of flesh and blood. They too, get cold and tired.